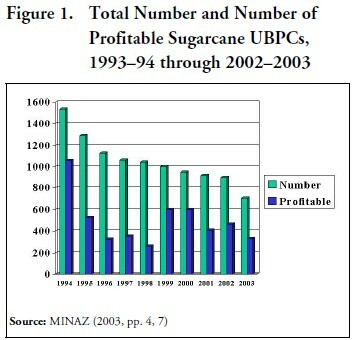 The objective of this paper is to provide a general evaluation of the performance of the sugarcane UBPCs during their first ten years of operation.2 Comprehensive data that have recently become available for these cooperatives (MINAZ, 2003) allow an evaluation following standard measures such as production and productivity, and revenue, costs, and profitability. The paper also reviews the extent to which the accomplishments relate to the original goals and objectives of the UBPCs. The paper ends with a discussion of some of the factors that appear to be limiting efficiency and profitability in sugarcane UBPCs. At the end of 2003, ten years after the creation of the UBPCs, the cooperative sector continued to be the dominant organization in Cuban sugarcane agriculture (Table 1). The UBPCs, together with the Agricultural Production Cooperatives (CPAs) and the Cooperatives of Credit and Services (CCSs), accounted for 83.6 percent of the total agricultural area, and for 90.6 percent of the sugarcane area. Since UBPCs control 75 percent of the total area in sugarcane, their performance is of utmost importance for the recovery of the sugar sector. • dissolutions for different justified reasons, generally for the state’s interest. Three indicators that measure agricultural production and productivity are harvested area, yield, and total sugarcane production. 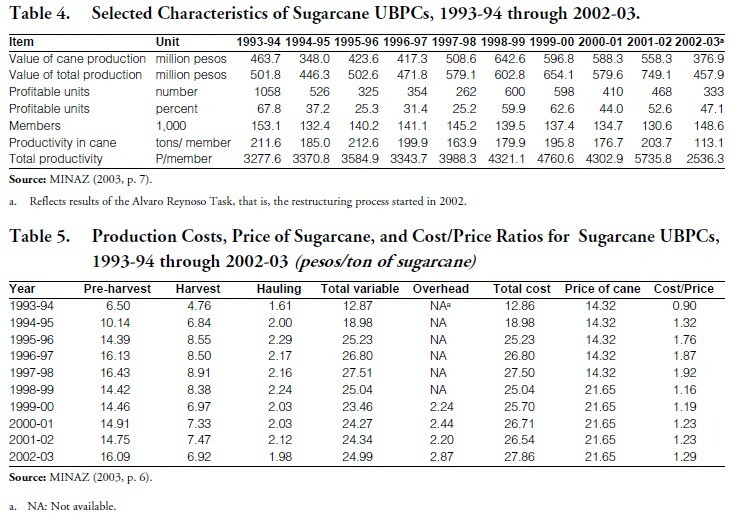 The ten-year performance of sugarcane UBPCs based on these indicators is disappointing (Table 3).4 Results of a simple linear regression analysis show an average annual rate of decrease in harvested area of 38,800 hectares per year (Table 2). Yields show a stable, yet discouraging, situation, with an annual average rate of increase of only 0.5 tons per hectare (Table 2). 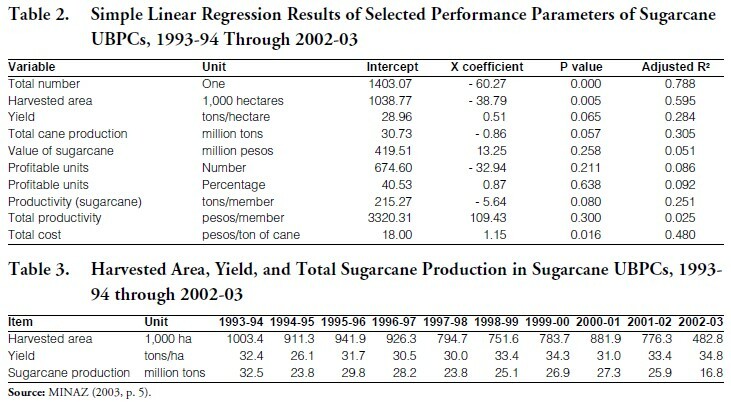 Sugarcane production averaged 26 million tons during the ten-year period, though production in 2002-03 was only about half of the volume in the 1993-94 season (Table 3). The average annual decline in sugarcane production was around 860,000 tons during the study period (Table 2). Changes in production per cooperative member provides useful insights into sugarcane productivity in the 10-year period. Productivity per member shows drastic declines, from 211.6 tons in 1993-94 to 113.1 in 2002-03 (Table 4). The average rate of decline was 5.65 tons per member per year (Table 2). It is interesting to note that, after years of declines and moderate increases, 203.7 tons per member were obtained in 2001-02, only to fall back to 113.1 in the next year (Table 4). How is that possible when the industry retained the most productive lands after the restructuring process? The problem of stagnant yields is even more relevant under the current restructuring process. The production targets under the Tarea Alvaro Reynoso, the agroindustry’s restructuring program, rest upon achieving yields of 54 tons per hectare. Obviously, even taking drastic measures, the goal of doubling agricultural yields will not be fulfilled in years to come. As a matter of fact, if the current annual average increasing trend of 0.51 tons/hectare continues, it will take more than 37 years to climb from the 34.8 tons per hectare of the 2002-03 season to the goal of 54 tons per hectare under the Tarea Alvaro Reynoso. The value of sugarcane crops in Table 4 reflects the changes in production discussed above. The drastic change in the value of cane production in the 1998- 99 season is due to an increase in the price of cane from 14.32 to 21.65 pesos per ton (see Table 5). The average annual increase was a little over 13 million pesos (Table 2). Little variation is observed in the value of total production which, in addition to sugarcane, includes other income. The number of profitable UBPCs, which experienced some fluctuations, fell drastically in the last season of the study period (Table 4). The average annual rate of decrease of profitable UBPCs over the period was of 33 units per year (Table 2). The same variable, measured in percentages, shows a more encouraging situation. Although the total number of units decreased every year, the percentage of profitable units increased in four of the ten years of the study period (Table 4 and Figure 1). The variable called “total productivity,” expressed in pesos per member, shows an upward trend until the 2002-03 season, when it fell by well over 50 percent (Table 4). The average annual rate of increase was of 109 pesos per member (Table 2). Production costs, price of sugarcane, and cost/price ratios are shown in Table 5. More or less stable costs of production (with an average annual rate of increase of 1.15 pesos per ton of cane, as shown in Table 2) contrast with the extremely low price of sugarcane, a price that is so low that it does not cover cost. The resulting cost/price ratios are disappointing. Except for a decrease in 1998-99 (the first season of the increase in the sugarcane price), they increased every year (Table 5). • autonomy of management and the administration of their resources with the objective of achieving self-sufficiency in the productive process. The mentioned MINAZ evaluation (2003, pp. 8-12) makes the following points with respect to the extent to which the four basic principles have been fulfilled. It was not until the end of 1995, during the celebration of the First National Encounter on the Linking of the Man to the Land, that 19 basic guidelines on this topic were set out. Slow progress was obtained until 2001, when MINAZ organized the labor force in Integral Cane Production Brigades (Brigadas Integrales de Producción de Caña, BIPC). Although MINAZ claims improvements in productivity and workers’ income, the report only mentions an increase in workers’ productivity in weeding in the last two years and that the median income in September 2003 was 325.4 pesos. By acknowledging that “there is still much to be done,” the report implicitly recognizes that the fulfillment of this principle has been at best quite disappointing. The results in this area are also disappointing. The lack of resources should not be an excuse since there are units that have reached acceptable results under the same conditions. Despite the increase in the availability of land for food production after the agroindustry’s restructuring, at the end of 2003 the UBPCs were only fulfilling 77 percent of their viandas needs, 46 percent of grains (rice and beans), and 9 percent of meat products. The report states that those results reflect deficient performance. From 1995 to 2003, the UBPCs built 20,780 houses for their members (an average of slightly over one per year per UBPC), but the number of new housing units decreased in the last three years, and none were built in 2003. Part of the blame, according to the report, falls on the country’s current resource limitations and the effect of hurricanes. Payment tied to results has been implemented with some variations in all UBPCs, but it does not reach all workers. Some results include an increase in median salary to 325.40 pesos per month; a monthly income in foreign exchange of US$8.32 in La Habana and of US$17.54 in Camagüey; and better use of the 7.3-hour workday. In this area, the report blames the administrators’ lack of knowledge of economics and management as the major impediment to achieve the desired results. To correct that situation, MINAZ has established a series of schools in cooperatives and regions to train managers and administrators. Sugar officials blame the Directors of Enterprises because of their excessive tutelage and their insistency in exerting control over the UBPCs. Producers have also complained about the Directors’ behavior as the main culprit in the lack of autonomy. Their role, according to the UBPCs’ leaders, should be to orient and assist them through a contractual arrangement. The author believes that a series of factors are hindering the development of the UBPCs into efficient and profitable units. They are discussed below grouped under four major categories: material incentives, organizational changes, foreign investment, and research and extension. Price of Sugarcane: As discussed in an earlier section of this paper, the price of sugarcane was 14.32 Cuban pesos per metric ton until the 1998-99 season, when it was raised to 21.65 pesos. That price does not even cover variable production costs. Cuban officials recognize that the price must be increased, but some disagree on the level of the increase. It is evident that a substantial increase is in order if more production is to be forthcoming. Payments in Foreign Exchange: A new incentive system that allows bonus payments in foreign exchange to sugarcane agricultural workers was introduced in the 2000-01 zafra. Nova González (2004, p. 61) has described how the system works. Depending on performance, the worker can receive up to US$15 (390 Cuban pesos) per month. Other monthly revenues in national currency include advanced payments (400 pesos), food for his family from the self-provisioning plots (300 pesos), and compensations (government subsidies) to the cooperative that translate into incomes of another 300 pesos. In the best possible scenario, monthly income of a UBPC member would amount to 1,390 Cuban pesos. That figure, however, only represents a little over US$53—an insignificant amount considering Cuba’s cost of living today, but more than five times higher than the average of 254 pesos per month paid for several agricultural activities and the overall national average of 261 pesos per month in 2002 (ONE, 2003). It would be even lower if the 300 pesos in food are deducted since the workers and their families earn them by working in the self-provisioning plots. About 93 percent of the country’s total sugarcane production comes from the cooperative sector: UBPCs produce 76 percent, and CPAs and CCSs combine for 17 percent (Nova González, 2004, p. 59). It is obvious that the current incentive system (including the extremely low price of sugarcane, currently at 21.65 Cuban pesos per metric ton), demands an overhaul to stimulate badly needed production increases. Those who are not familiar with Cuba’s sugar agroindustry will find it hard to believe that the country does not have a fully operational payment-for-quality system. The norms and guidelines are there but the system does not work. Although individual cane samples are taken at the acopio (collection and cleaning) centers, they are mixed inside the mill. Thus, the grower’s payment is based on the weight of his cane sampled at the acopio center, and on the average sucrose content of all the sugarcane milled. Efficient growers are thus penalized by the low sucrose content of inefficient producers. This is discouraging for the grower. Payment for quality is enforced in almost all cane producing countries of the world and Cuba should not be an exception. Autonomy: Ten years after their creation, the UBPCs still do not enjoy full autonomy. The official reasons were summarized earlier in this paper. Needless to say, the autonomy is badly needed. Lip service will not do. It is hard to believe that the Cuban leadership cannot enforce this legal provision. However, MINAZ’s philosophy does not seem to convey a changing attitude. For example, in the 10-year report (MINAZ, 2003, p. 12), MINAZ asserts that the state enterprises should continue “to exert state control over these [UBPCs] units” (p. 12). That statement is very revealing about the degree of autonomy of UBPCs. Input and Output Markets: These markets should be liberalized. This policy change is a sine qua non for the sugar agroindustry to prosper. The inefficiencies and corrupt practices that result from the monopolistic control of the state over these markets are noticeable in Cuba. This is perhaps the area where Fidel Castro’s recognition that “all openings have brought risks” applies best. Yet there is no apparent alternative solution. Despite the different forms of foreign investment allowed by law, the Cuban government has systematically excluded the sugar agroindustry. Foreign capital was permitted for financing the purchasing of inputs in the mid- and late-1990s, and is now allowed in byproducts and derivatives. However, foreign investments in sugarcane milling and raw-sugar refining continue to be banned. For example, as recently as June 16-17, 2004, a Business Meeting between MINAZ officials and potential foreign investors was held in Havana within the framework of “Diversification 2004: International Congress on Sugar and Sugarcane Derivatives.” Twenty-six specific investment opportunities were offered in the areas of sugarcane byproducts, sugar derivatives, and food production or processing. None was offered for milling or refining (“Carpeta,” 2004). The same picture is presented in a booklet of the Ministry for Foreign Investment and Economic Collaboration (CPI, 2003). The practice of preventing investment into sugar production is impacting the industry negatively. Cuba’s sugar agroindustry is in desperate need of capital and Cuba does not have it at present. The role of research and extension in the growth of an agricultural sector cannot be emphasized enough. Cuba has an impressive number of extremely well qualified scientists at all levels in ministries, universities, and other governmental agencies. The amount and quality of research related to the sugar agroindustry is quite impressive.5 The problem is that, most of the time, valuable results are lost in a multitude of bureaucratic layers. In other occasions, recommendations cannot be implemented because the country lacks the resources to do so. The predominant problem, however, rests on the preference that the country’s leadership places on politics over science in their decision-making. Cuba’s Extension Service for sugarcane is organized under the Ministry of Sugar’s National Institute of Sugarcane Research (Instituto Nacional de Investigaciones de la Caña de Azúcar, INICA). Its dual research/ extension role is of recent vintage, and INICA has grown to become a remarkable organization.6 Its Scientific-Technical Specialized Service Unit is comprised of three departments: the Fertilizer and Amendment Recommendation Service (SERFE), created in 1996; the Variety and Seed Service (SERVAS), created in 1998; and the Phytosanitary Service (SEFIT), created in 2000 (Campos Asín et al., 2003, pp. 35-36). The Institute also deals with technology transfer, technological innovation, training, and the dissemination of knowledge (Sulroca et al., 2004, p. 9). Extension is ready to expand and should play an important role in the process of transferring technology, not only from INICA, but also from other research organizations. When this man goes to the field without worries because his food and that of his family is secured; sees his basic needs solved; when he feels he is the owner of the fruits of his labor; when his income is related to his production; when his own actions are the ones that solve the collective’s problems; when he feels his work is socially acknowledged; finally, when the basic principles for which the UBPCs were created are fulfilled, we are convinced that there will be more sugarcane (Jústiz García and Díaz Pérez, 1995, p. 16). 1. 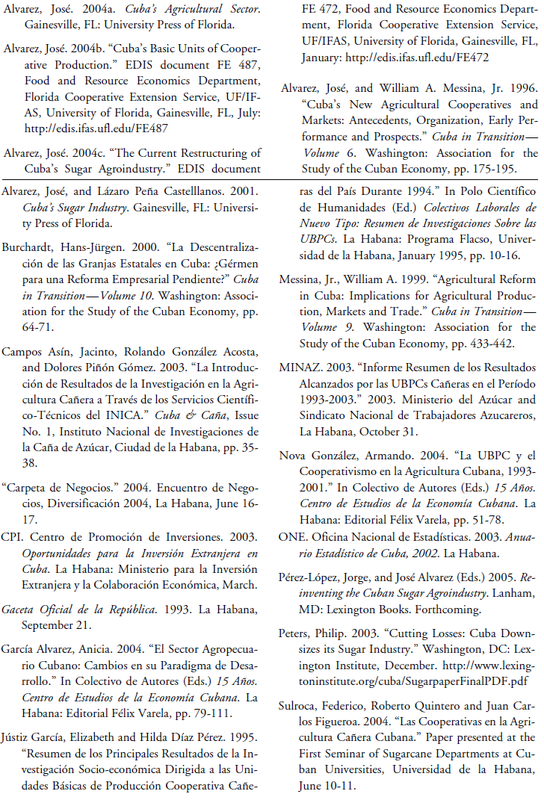 For a partial list of publications on UBPCs available from Cuban sources, see Alvarez (2004a). Relevant publications in ASCE’s Cuba in Transition proceedings include Alvarez and Messina (1996), Messina (1999), and Burchardt (2000). 2. Evaluations for the early years can be found in Alvarez and Peña Castellanos (2001, pp. 56-60), and Alvarez (2004a, pp. 81-89; 2004b). For an assessment of the current restructuring of the sugar agroindustry, started in 2002, see Peters (2003), Alvarez (2004c), and Pérez-López and Alvarez (2005). A recent Cuban publication (García Alvarez, 2004) contains an interesting article on Cuba’s new agricultural paradigm. 3. This is not a farfetched observation. In the last few years, actions by the Cuban government seem to indicate a reversal of the timid economic reforms of 1993-95, as discussed by several speakers at this Conference. 4. The 2002-03 season should be considered separately since it is the first zafra under the agroindustry’s restructuring, during which sugarcane area decreased from 1.5 million hectares to 864,000 hectares (MINAZ, 2003, p. 3). 5. The author can testify to that fact from the personal experience gained during his numerous professional visits to the island in the past eleven years. 6. Based on what the author had seen three years earlier as compared with the results presented at the Round Table entitled “The Cuban experience in extension and scientific-technical services for sugarcane,” by INICA’s scientists Rolando González, Jacinto Campos, and Roberto Quintero, at “Diversification 2004: International Congress on Sugar and Sugarcane Derivatives,” held in Havana on June 14-18, 2004.